On the day war broke out, few nations imagined they would soon be forced to conduct land warfare outside of Europe. As a result, when the war reached North Africa, both men and machines were ill-prepared for the harsh demands of a desert campaign. But history is a testament to the caliber of leadership, ingenuity and resolve of those who fought under such harsh conditions. Thanks in part to its long-established presence in far-flung corners of the globe, no army would display these qualities better than the British Commonwealth Forces. New rules including: the "Stiff Upper Lip" so common to the British Commonwealth Forces, the Motorized Divisions and "Artillery Bravery" of the Italian Royal Army, and a new class of embedded equipment pieces - the Special Weapon Assets! 8 Historical Scenarios: from the tank disaster of Operation Battleaxe at Halfaya Pass to the relief of the Siege of Tobruk in Operation Crusader; 5 scenarios cover the drawn-out engagement of the Battle of Gazala! 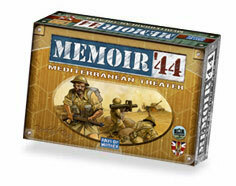 This is another great expansion for Memoir '44. It adds new miniatures, new rules, new tiles and of course new scenarios. I particularly like the new rules for embedding weapons with infantry units, which adds a new level of customization to the game and opens up new tactical possibilities. This expansion is more complex than the base game, but has so much more to offer. Takes you through some cool and gritty battles. Also new terrain tiles! You know your in for a great expantion when you discover this set comes with one of the most deadly special ops teams in history.....................The legendary British SAS! Worth the money!